High-low (Break) is a continuity offence that exploits offensive matchups on the perimeter and inside (with low-post 5). The weakside corner is the perimeter match-up spot, here 1 is a perimeter match-up (there can be more than one), on a pass to 2 he basket cuts to the weakside corner, 3 moves high to the reversal (easy) spot, and 4 goes to the high post, into a high-low situation. See Offences - High-low, Carleton Ravens. also High-low sets. There is no help when 4 has the ball at the high post, he reverse pivots and looks for a high-low pass to match-up 5 (if X1 stays out on 1) or a skip pass to 1 (if X1 sags to help on 5). A skip pass to 1 is an attacking situation, look for a shot or drive. Option - 5 crosses the lane to post, 4 dives to replace 5.. If 4 passes back to 2, look to get the ball inside to 5. See Zone offences - High-low basics, Hubie Brown 1-4. Get into high-low any time the player in the reversal spot finishes the swing, he clears weakside. Here if the ball is reversed through 3 to 1, 3 clears, 4 and 5 flash into another high-low. This is not an attacking situation, but does get 5 in the other low post. If there is no skip or high-low pass, 4 can use a dribble-at (dribble-screen) to create an attacking situation, 3 backcuts on eye contact and clears, 1 gets a dribble handoff, 4 rolls or pops. 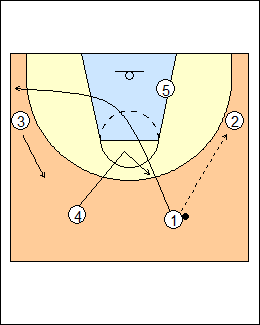 See Offences - Carleton Ravens, 1-4 Dive Series, Kowalczyk ballscreen, High-low sets (e.g., 5 circles up to pick and roll). Here 1 passes to 2 who finishes the swing to 3, 2 clears high weakside, 1 goes back to the matchup spot, 4 flashes into another high-low. If 3 is also a match-up, 4 can pass and follow to pick and roll or pop (Fist). 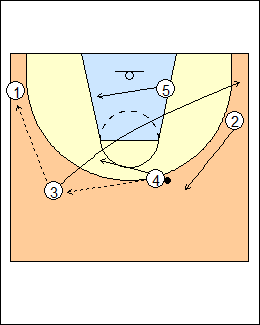 If 4 rolls (shown), 1 fills behind the ballscreen, 5 steps to the short corner. 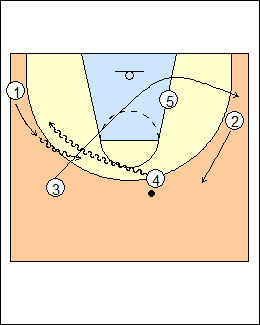 Optionally 1 runs the baseline, creating more space for 4 to pop. 4 can dribble-screen if 3 is denied. 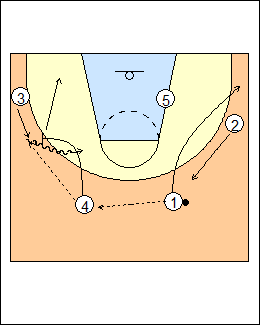 Fist-slip - if 4 slips the ballscreen, 5 circles up to pick and roll. See Offence - High-low sets (Twist, Twist-slip), Fast breaks - Unicaja Junior (4 needs space to play in isolation). 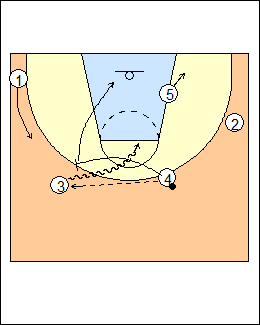 If the ball stalls on a wing, 4 can ballscreen to reverse the ball, 5 relocates weakside, 4 can roll or pop, then get to the high post if 3 finishes the swing to 1. Variation - 4 backcuts if denied, 5 creates space with an exit cut to the short corner. See Offences - 1-4 Dive Series (Huskies), Denial counters, Quick hitters - Clear sets (Black, Double black), Cavs Pistol series, Fast breaks - Unicaja Junior (4 picks and pops if the ball can't change sides because of good defence). On a low-post entry, 2 relocates along the perimeter, 4 dives weakside to the basket, 3 replaces 4 (90 degrees above the ball), 1 gets to 45 degrees on the weakside. If 2 is in trouble on the wing, 5 goes out to the short corner, 3 gets high ballside or behind the ball as a third short passing option, and 1 gets in vision on the weakside. If 3 is a better perimeter match-up, 1 passes to 2 and clears to the easy spot, 3 stays in the corner. Here 1 backscreens to help 4 get open for a pass. See Offence - High-low sets. 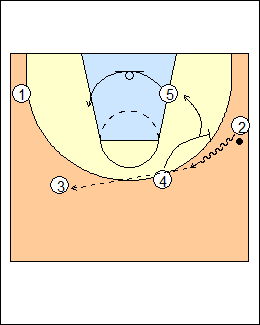 1 passes to 4, who passes to 3 and follows to pick and roll (shown), or uses a dribble-screen. Here 1 exchanges with 2, who can then get to the opposite corner if he finishes a swing to 1. Swing slip - 4 passes to 3, slips a ballscreen, 5 picks and rolls. 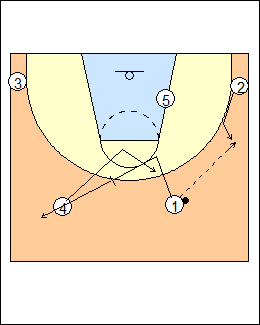 See Fast breaks - Early ballscreens (Swing, Dive), Offences - Break 1 (Slip, also Double slip, Power, Flarescreen), High-low sets (Gonzaga), also Carleton Ravens for a different approach on ball reversal (backscreen-stagger).